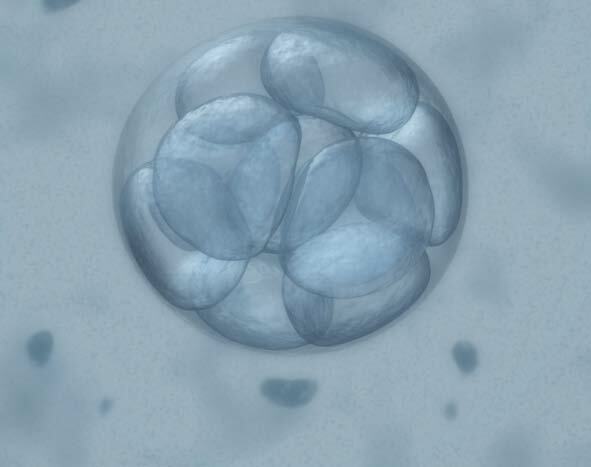 A landmark study, published in Nature on August 2, 2017, has described the first timein the U.S. that CRISPR was used to repair a germline mutation in human embryos created through in vitro fertilization. The study was a collaboration between the Salk Institute, Oregon Health and Science University (OHSU), and Korea's Institute for Basic Science. The scientists behind the work, led by Shoukhrat Mitalipov, Ph.D., of the Center for Embryonic Cell and Gene Therapy at OHSU, concluded that the technique to replace a mutation in the gene MYBP3C could help prevent hypertrophic myocardiopathy (HCM), a disease that eventually leads to heart failure. This study is the first in the country to demonstrate that modifying single-gene defects using the gene-editing technology CRISPR has the potential to be safe and accurate enough to use in human embryos. The researchers set out to determine if they could prevent the germline transmission of a genetic mutation causing HCM. In samples with afflicted sperm—which were confirmed via preimplantation genetic diagnosis (PGD) to carry the mutation that causes HCM—scientists used CRISPR to cleave out damaged sections of DNA. Then, they replaced the mutation with new genetic information, trying a few different methods to incorporate the corrected gene. Once edited, 42 out of 58 embryos lacked the HCM mutation. Mosaicism, noted the authors, could have major negative effects and could restrict the clinical applications of the gene-editing technique in embryos, a fact that the authors identified as a limitation. In addition, the uncertainty surrounding the ability to reproduce the study’s findings was also a limitation, the authors acknowledged. Employing CRISPR in embryos, rather than in stem cells, yielded better results: The overall targeting efficiency in human embryos was found to be 72.2% (13/18), which was higher than the rate in induced pluripotent stem cells (iPSCs) exposed to the same construct (27.9%, or 17/61). The higher targeting efficiency “suggests that human embryos employ different DNA repair mechanisms than do somatic or pluripotent cells, probably reflecting evolutionary requirements for stringent control over genome fidelity in the germline,” the authors wrote in the paper. Because off-target cutting is also a concern with CRISPR/Cas9, researchers evaluated all of the potential off-target sites via a whole-genome sequencing analysis. They determined that their technique did not produce “any detectable” off-target mutations in the blastomeres.